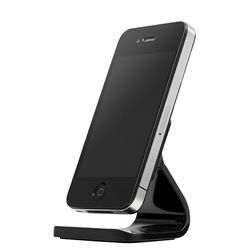 Utilizing micro-suction pads that are reusable, easily cleaned, and guaranteed to not leave any residue, the Milo is a clever viewing stand for your smartphone. It's perfect for hands-free movie viewing, video conferences, or just as a convenient home base. It works in both landscape or portrait modes and works great with almost any smooth surface. Compatible with iPhone 5 May not work well with certain silicone or textured cases. Device shown not included.